FREE 5 YEAR/100K WARRANTY!! 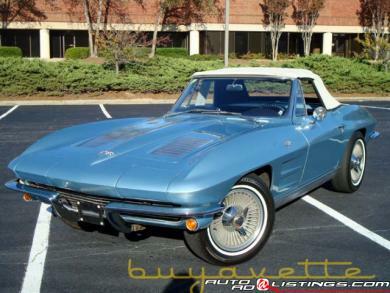 SEE MORE PHOTOS OF THIS VETTE AND 125+ OTHERS FOR SALE AT WWW.BUYAVETTE.NET! Code correct Silver Blue exterior, code correct Dark Blue vinyl interior, White convertible top. Numbers matching 340hp 327ci engine, 4 speed manual transmission. This midyear 'vert is in exceptionally nice shape, and is very original and correct as well! Showing a body assembly date of January 2, 1963, this is certainly one of the nicer '63s around. The paint is very good overall, showing plenty of shine and few, if any scratches and scuffs. The convertible top is extremely nice as well, with a clear window and no apparent staining on the top. The chrome bumpers are in excellent shape, looking to be either new or very recent. Exterior door handles are very good as well, with no pitting or dullness on the finish. A set of reproduction knockoff wheels are mounted on this car, and look great with no pitting or other major blemishes. Tires are redline radials. The tail lights on this midyear look to be new and are free from cracks and fading. Weatherstripping is intact and in good shape. The interior is as nice as the exterior, with very good seat covers showing minor wear, and very good loop carpet with no fading. Also particularly nice on this car are the gauges, which show bright needles, clear lenses, and even a working clock. Seatbelts look to be original. Door panels on this car are very good to excellent, with no tears or loose trim. Steering wheel is in good shape also, and the dash pad is free from cracks. The engine compartment of this '63 shows very well, and has many original and correct parts. The block shows a casting date of December 5, 1962, and has a correct intake, exhaust manifolds, and Carter AFB carburetor. The transmission is numbers matching, and this Vette wears correct radiator hoses and clamps. Alternator shows casting number 1100578. Factory features include 340hp engine, and 4 speed manual transmission. FREE 5 YEAR/100K WARRANTY!! REDUCED!! $44,900. Financing Available.